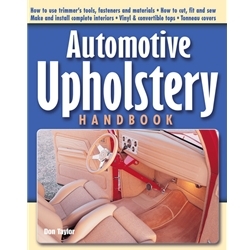 How to make and install great interiors for any car, truck, van, RV, boat or airplane. Sew like an expert--on vinyl, leather or any fabric. Restore, recover and build bench and bucket seats. Upholster armrests and door panels. Make and install headliners and carpeting. Install convertible tops, vinyl roofs, sim-con and landau tops. Create street rod interiors. Build boat and motorcycle seats. Complete and detailed step-by-step instructions help you apply the right techniques to your own projects.